Spring has finally arrived after a seemingly interminable winter, and people are out and about enjoying the sun and the sights of Berlin. Different parts of the city offer their respective attractions like the tour favourite Museuminsel, or Prenzlauer Berg with its hip, bohemian atmosphere. Dahlem – the district that is home to Freie Universität, the Berlin Botanical Gardens and the Ethnological Museum – is not often mentioned in students’ plans to go around the city, and with good reason. From Pankow, it takes more than an hour to reach Dahlem via transit railways, but the freedom of spring break allowed a couple of ECLA students to make the trip to the district’s group of museums. The Ethnological Museum may not have the glorious neo-classical architecture of the Altes Museum or the modern minimalism of the Neue Nationalgalerie, but it makes up for what it lacks in architectural impressiveness with troves of archaeological artifacts from different regions of the world collected through various processes of appropriation. Walking into the Museum of Asian art, one immediately sees sculptures of which a number represent Buddha as he is conventionally depicted—seated with legs crossed, eyes closed as if in deep meditation. One notable display is a series of friezes depicting the life of Buddha from his origins to his enlightenment. 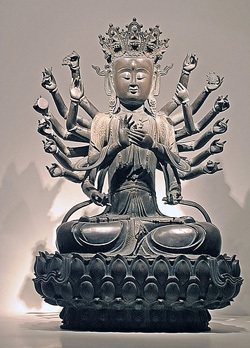 There are also statues of various Bodhisattvas – notable individuals who are reputed to have attained enlightenment. On display in the Indian room are statues of Hindu gods and figures. One depicts Ganesha, an elephant-headed deity, while another is of Brahma, the Hindu god of creation, identifiable through his four faces and two pairs of hands. There is a relief of Vishnu in his incarnation Krishna, conversing with Arjuna, which is the central scene of the Bhagavad Gita. The spectator is especially drawn toward a wooden Jain altar from the eighteenth century. From afar, the altar seems like a miniature model of a temple but on closer inspection, there is a sculpture of Buddha inside and all the walls, interior and exterior, are covered with reliefs carved onto the wood. Upstairs is a hall of golden Buddha sculptures originating from Southeast Asia (Cambodia, Myanmar, Thailand) and glass displays of colorful ancient scrolls. The hall houses more ornate artifacts which have been dated from the sixteenth to the nineteenth centuries. Across the halls of Asian art is another section of the museum housing artifacts from Central and South America. It is a spacious hall punctuated by huge stone sculptures in the middle and stone walls at the sides, that must once have been part of an ancient edifice. Many of the stone sculptures are of animals: for instance, of a snake, or a frog. There is also a large tapestry displayed which seems to be a recording of events depicted through tiny human figures and their activities. This hall connects to two other sections, one reserved for North American Indians and another for artifacts from the South Seas or Pacific Islands. Another part of the Dahlem Museums is reserved for African art, the entrance to which is a dark, enclosed room with displays of primitivist wooden statues made by more modern artists originating from Sub-Saharan Africa. Many of these depict figures with exaggerated sexual features akin to portrayals of fertility gods. While walking through the dark hallways, one can hear faint sounds of beating drums and howling which eventually leads to a room with a video of projection of a tribal ritual, surrounded by tribal masks. This room is markedly different from the room of African contemporary art only a few paces away. The contemporary art room has a makeshift wall constructed like a collage of decaying industrial materials. Across this wall is the display of a car, which, upon closer inspection, proves to be a coffin. Three hours was not enough to see the entire museum, and perhaps, that is for the best. One eventually reaches the point of being overwhelmed by the sheer number of artifacts that have somehow been collected and concentrated in one building. The museum itself is a curiosity, encasing worlds from different eras but also standing in homage to the societies and civilizations from which its contents are drawn. As a visitor and spectator, one occupies, rather strangely but of necessity, the position of both consumer and critic; the former enjoys the sense of fascination derived from viewing such displays while the latter questions the manner of display, and whether it fetishizes different cultures. This question stands alongside, even broadens the scope of the other issues of memory, history and responsibility of which Berlin is a site of contemplation. An afternoon of such reflection makes it a trip well worth taking.